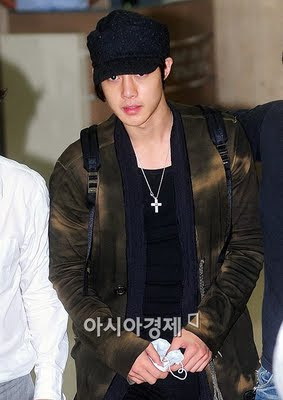 As the first Korean celebrity to be hit by H1N1, many of Hyun Joong's fans were deeply worried about his health, with many turning up at the airport to welcome their idol back. Wearing a mask for precautionary measures, Hyun Joong was requested to take it down for interviews and he obliged. Hyun Joong looked visibly thinner and worn out from his ordeals and we hope that he will get back in tip-top condition for himself and his fans. Hyun Joong said in a quick interview that he had fully recovered and told his fans to take safety precautions against the H1N1 virus. 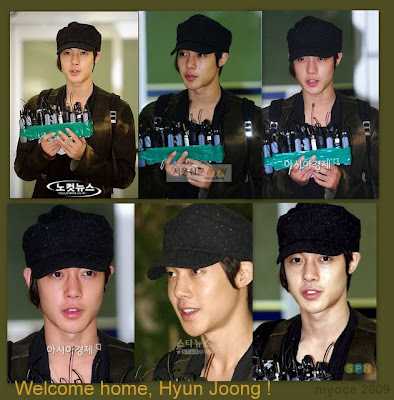 Soooo glad you're back, Hyun Joong. Please take care and be strong, Fighting !! Photo credits as labeled, SS501UFO and SS601.